Each 100 g contains: Iron (as iron-AHM*) 6000 mg, Zinc (as Zinc-AHM*) 4000 mg, Copper (as Copper-AHM*) 1000 mg, Manganese (as Manganese-AHM*) 2000 mg, Iodine 20 mg, Cobalt (as Cobalt-AHM*) 25 mg, Selenium (as Selenium-AHM*) 15 mg, Chrome (as Chrome-AHM*) 10 mg, *Methionine (AHM) 35 000 mg, excipients q.s. ad 100 g.
Covers the requirements of microminerals on piglets, optimizing their genetic potential for optimal growth and development. 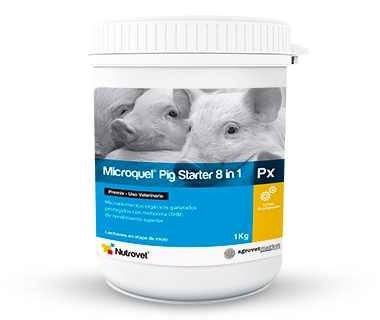 Prevention and treatment of mineral deficiencies associated with the formula in piglets on growth stage, until the animals have less weight to 50 - 60 kg. The organic chelation with AHM protects minerals from non-desired reactions in the intestine, the release and passive absorption though the intestinal lumen and exceptional improves in comparison with inorganic minerals. Its inclusion in the food formula of the piglet allows improving the palatability.